2. Introductions begin with “What would you like to drink?” The proper answer is sweet iced tea. It’s the wine of the South. 3. You find yourself located in the carpet capital of the world. 4. Grits is groceries. We eat them for breakfast, lunch, and dinner. 5. Hushpuppies are for eating not for wearing. 7. You attend Octoberfest in an alpine village. 9. You savor Swamp Gravy. 11. There’s a Waffle House on every corner. 12. You need a phrase book to understand the natives. 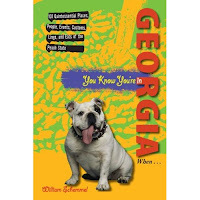 Examples: “That dog don’t hunt”; “All vine and no taters”; “That’s so good you’ll slap your granny”; “Shootin’ the Hootch”; and my personal favorite “I’m fixin’ to”. Not sure what these mean? Check out the Urban Dictionary or ask me in comments. 13. You hear funeral announcements or the county hospital report on the radio. You have to go pretty far outside of Atlanta to hear this now, but it still exists. How else would you know who to go “a visitin’” after church on Sunday? Catch more Thursday Thirteens for your reading pleasure. I love Georgia and iced tea AND hush puppies (I'm from FLARDAH). And--though I never thought about it---it's so TRUE about the Waffle Houses. Thanks Damozel. Every now and then I just have to have my Waffle House "fix"! I love eating at Waffle Houses! I think I'll be back often - what wonderful, historical brain food you share here! Hi, "This Girl". I'm glad you wandered in. I really needed a compliment today. You lifted me up. Ah Helen, where even the Waffle House looks like it came out of an Alpine village. What Is Your Dream Teaching Assignment? My, Where Does the TIme Go?